For these items I need some advice and would appreciate receiving any information you are kind enough to share with me. Those that have been answered are still on this page, further down, after the items that still need attention. But please have a look and maybe you have some more information to add. 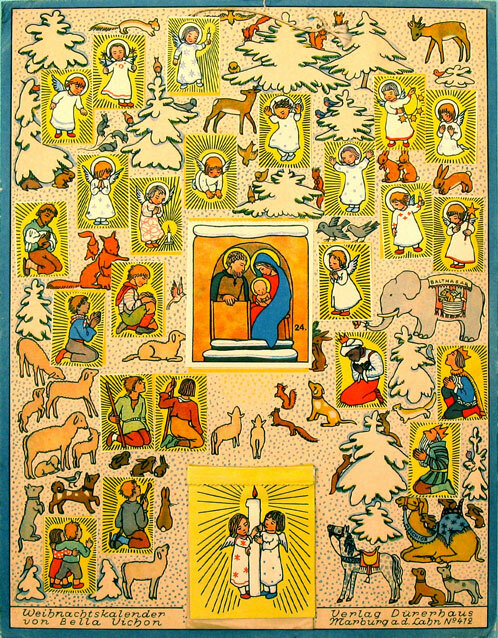 Advent Calendar A126 and Nativity N41: More information on the publisher John Bradford and the artist, H-HF, please. According to the Archives of the city Toronto, "Limited" only appears in 1943, before then it is "John Bradford Co."
In the meantime there have been some developments. Not in the solution, but bringing some more questions! 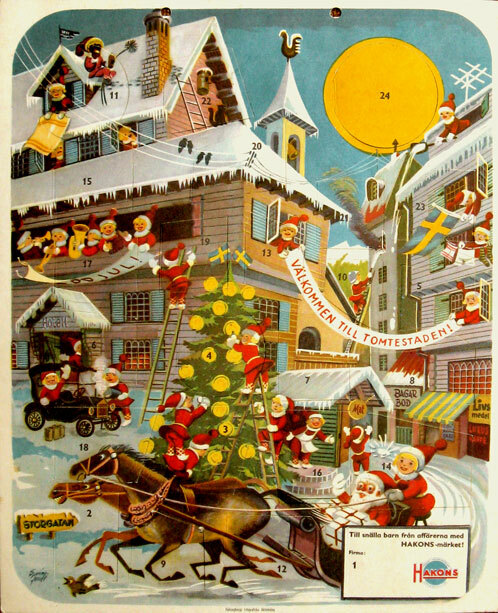 On Ebay (December 2013) I saw the same calendar, but it was marked "Copyright Copenhagen, Carlsen Verlag Hamburg, made in Denmark" , while mine is marked "Copyright John Bradford Limited Toronto, Canada". The Carlsen department in Hamburg was founded in 1953; Carlsen was sold to the Swedish company Bonnier in 1980. " At the bottom is either the printer’s or publisher’s reference “038 KÜLPER, ERFURT 16988” and the signature “LG” or “BG” or "L Oj" ? Ref. Tina Peschel's book, pg. 253, para "128: ...... Erfurt (Külper) sign. L. Grewen (o.J.) ...."
I would like confirmation on the signature and information about the artist. Here are drawings that show the same artist and with some tricks I have been able to more or less recognize the same signature. 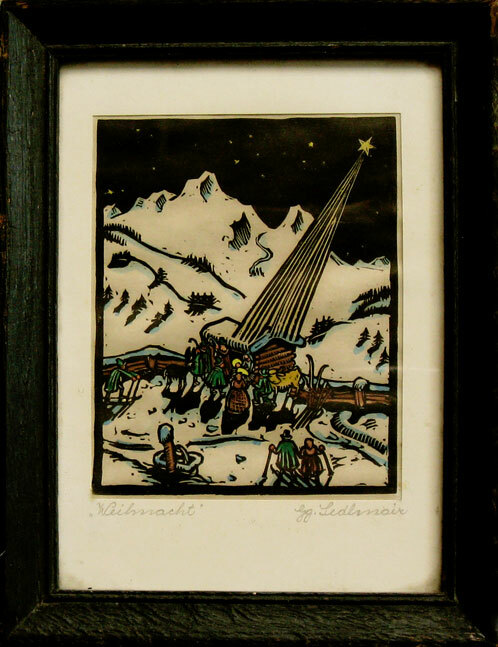 Nativity woodcut engraving, signed "Weihnacht" and the artist "Gg. Ledbanair"
- "Gg Ledlmaier", the Gg probably being "Georg"
but no information has come up regarding an artist with this name, so still need help here. 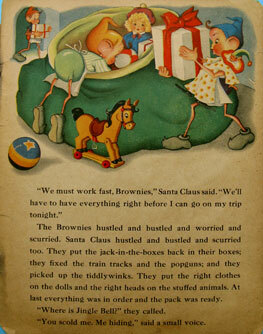 It is not dated, but considering the framing I would think 1900-1920s. 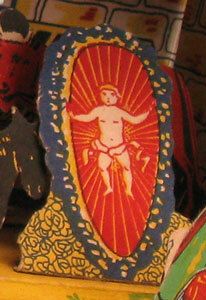 Dimensions of the engraving: ca 8,50 x 11cm. 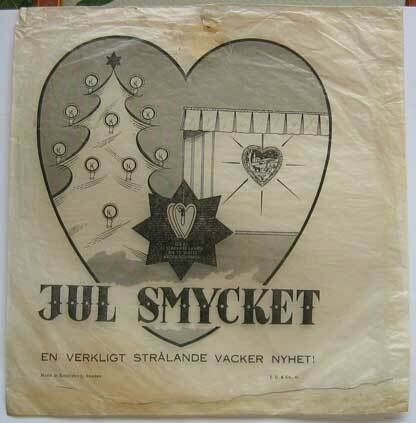 There is an instruction to remove the back sheet and that there would then be a Christmas game. I do not want to remove the sheet, but I hope someone knows what the game is about. Peter has told me it is a dice game. A photo of the back would be lovely; can anyone help please!. 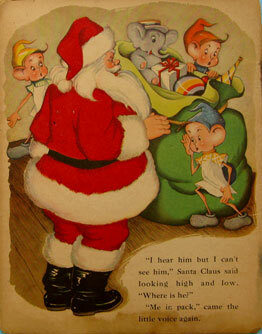 “HELP” appreciated here on the “LS” monogram’s meaning, and publisher of the Advent calendar. SOLVED! 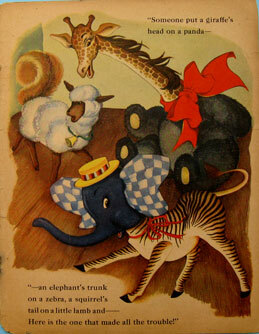 Thanks to Bea Klopstra, it is the monogram of Lilly Scherbauer, illustrator of children books and postcards. 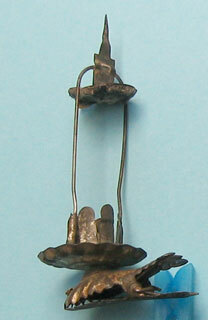 It is a glass holder with which could be a stopper at the top. It is open at top and bottom. You can see a trace of possibly some liquid in the glass holder. If there is a stopper then the hanger is the wrong way around. Possibly I am showing it upside down? The red ribbon has a weight, sewn in at the end. 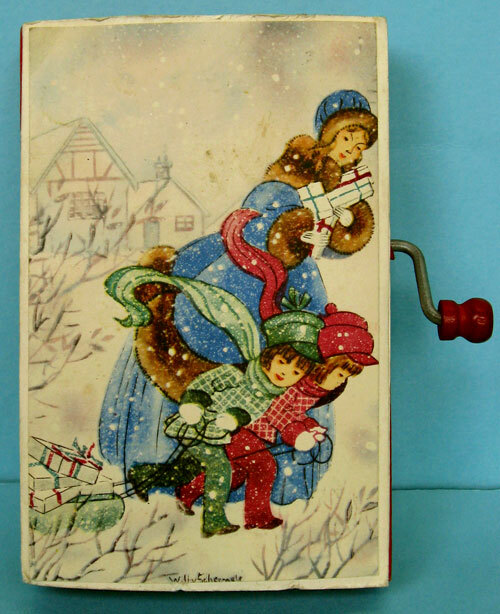 I found this in a box with other Christmas items and at first sight I thought it was an oil light. 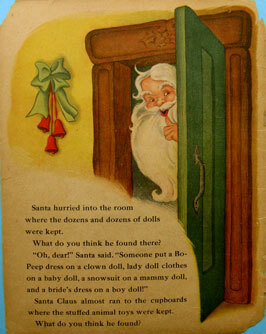 But when home and upon inspection I was puzzled, and still am. Anyone an idea? Need more fotos, just ask. 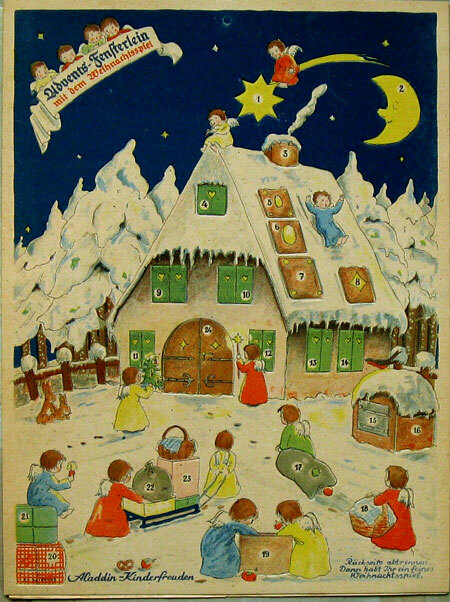 A200: Adventkalender with text "Weihnachtskalender von Bella Vichon". Help! : I would like to have more information on Bella Vichon and the publisher "Verlag Dürerhaus". The painter Bella Vichon (born 1910 in Temesvar / Austria-Hungary, d. 1973 in Quakenbrück) studied at the art schools in Vienna and Gothenburg and worked as a teacher at the women's school for social professions in Thale / Harz. 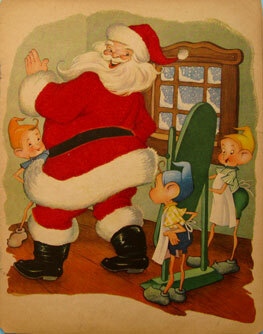 She became known for their especially colored book illustrations, which treated also very beautiful Christmas themes. 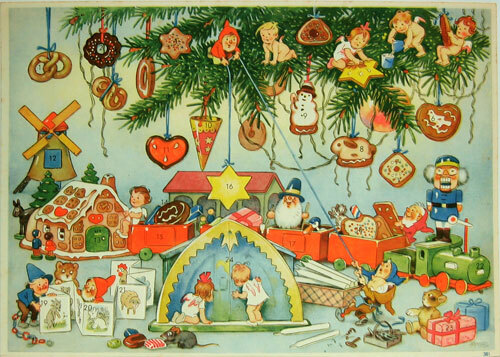 Later she gave out toys produced in his own workshop for hand puppets and marionettes in Osterburg / Altmark. Beginning in 1945, they initially lived then in Menslage, from 1965 in Quakenbrück, where she had worked freelance until her death. 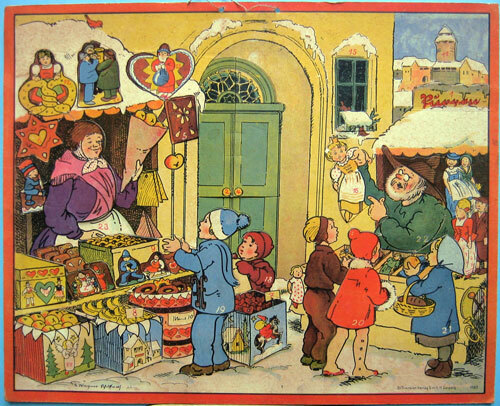 "Dürer" houses were/are shops where exclusive arts and crafts items were sold. 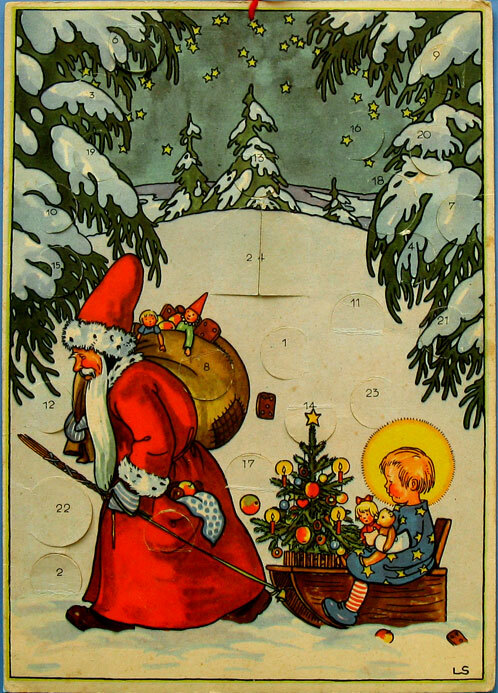 Before 1945 the Dürerhaus Marburg also issued Advent calendars, eg by Fritz Baumgarten and Ruth Busch Schuhmann. 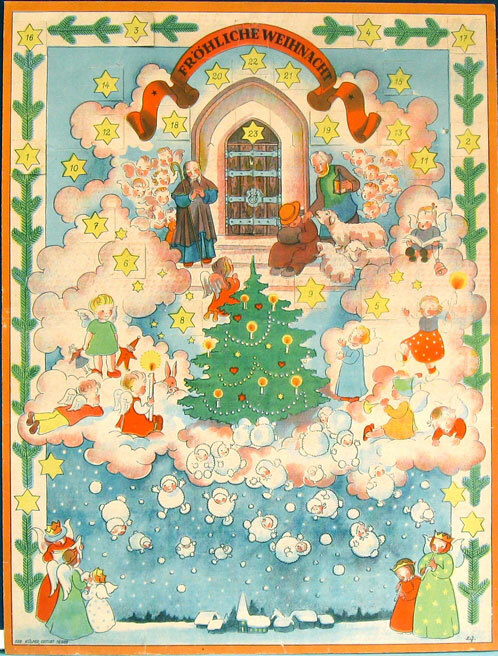 Also Advent calendars by M. Bantzer in this collection. 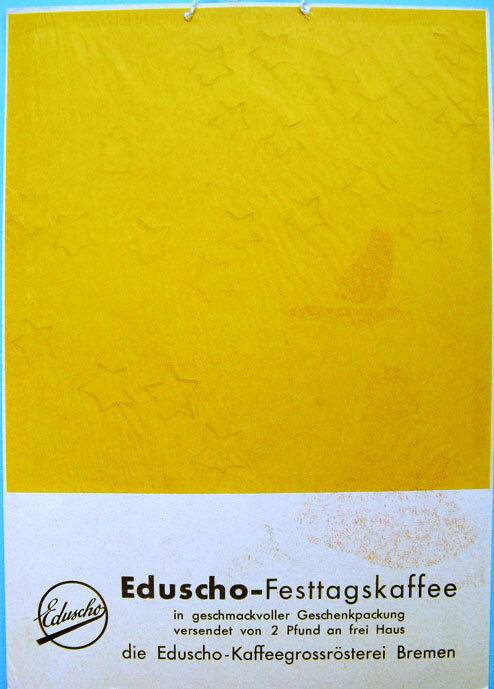 a) Numbered stars are to be broken-out, not opened, but I can see no pictures on the yellow transparant backpaper. 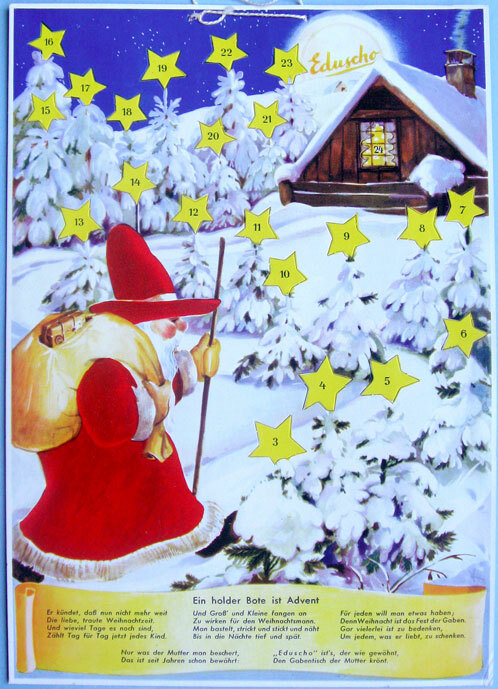 Why is this, SOLVED: should just show a heaven full of glowing stars. b) Below right, above the banner is a monogram "K". Artist ? c) Different Eduscho logo's and the period used would be lovely. 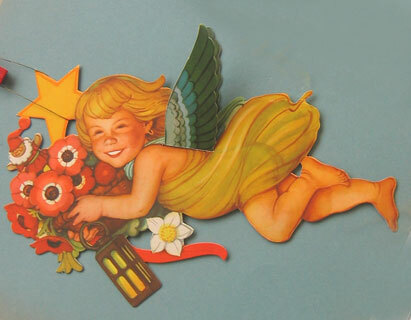 Please help me in identifying many of the publisher's and/or printer's logo's of postcards. 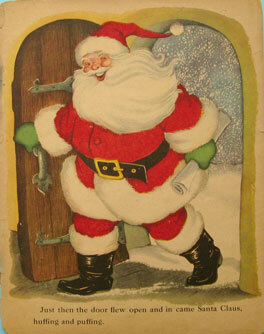 This link will direct you to the postcard page, with the list of logo's..
No mention of publisher, printer or designer. Any information is welcome. 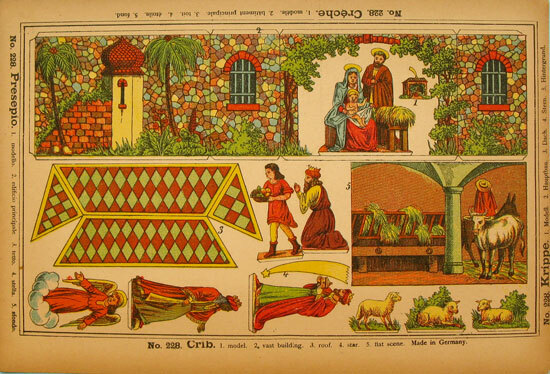 A cut-out crib, No. 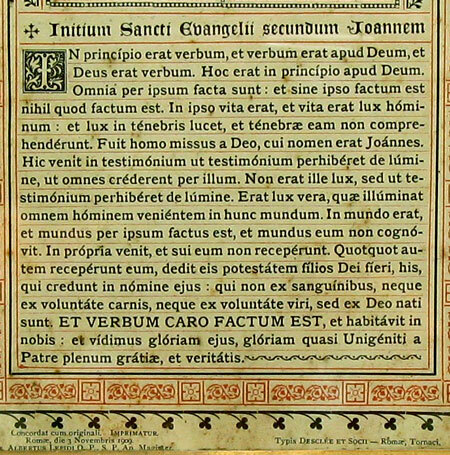 228; description is in four languages (English, German, French and Italian. Made in Germany. 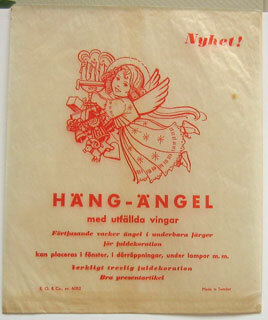 I have not found any information on an illustrator Springfeldt connected to either Hakon or Helsingborgs Litografiska Aktiebolag. 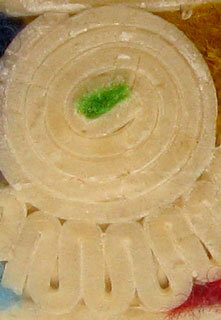 NEED HELP: The first box candles is marked with this logo "LSH"; anyone any idea which company ? Firm started in 1853 in The Netherlands, "Spaas Kaarsen nv". it is signed with, what looks like "F. Loger". I have been unable to find anything on this artist; help for any information in this respect. They could have been included in packets of the Albert Heijn products, but this is just a presumption. 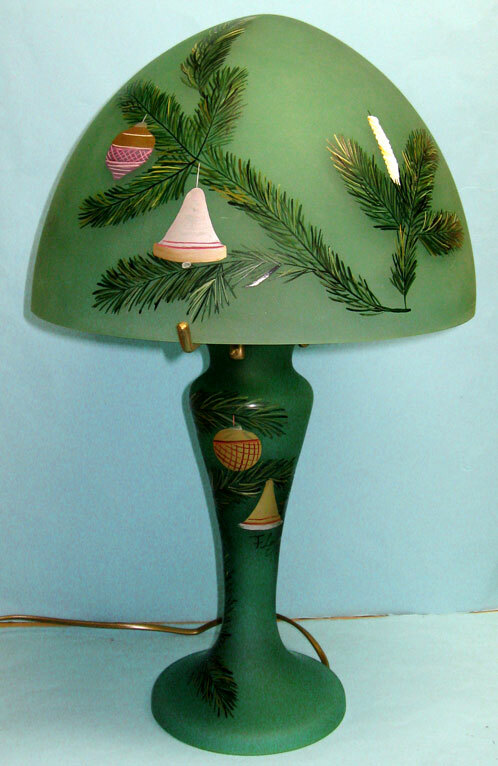 Would also very much appreciate to know when these were published, name of the designer (monogram probably "EJ"). 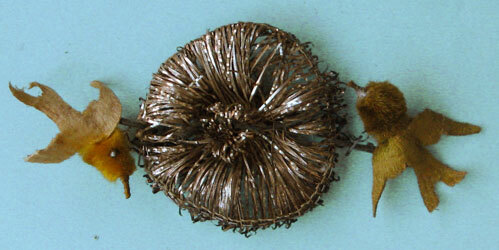 Tinsel flower birds nest, two yellow textile birds, attached with dark paper cover wire; on top there is residue of the wire, so something must have been attached; total width ca 9cm. 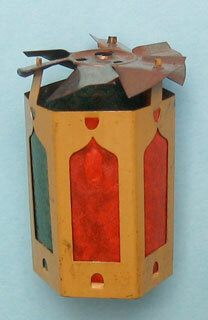 I have contacted people but we have not been able to find a similar ornament. Help please. 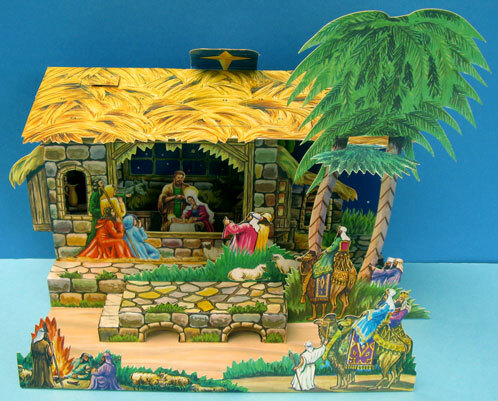 Small fold-out or pop-up nativity, partly made of cut-out figures that have been glued in the stable, with detachable roof, which has been replaced, the original one being lost. Another peculiarity are the figures of Child Jesus, Mary lying down in the hay and the group of five admiring figures in front. 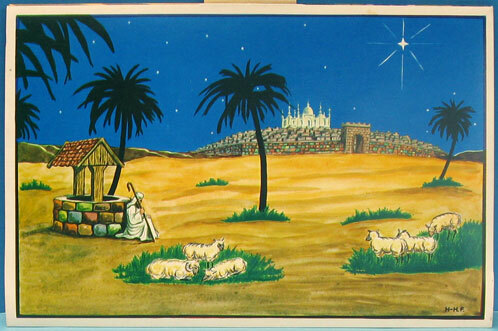 They do not seem to belong to a nativity, but to another religious event. Also Joseph is missing. 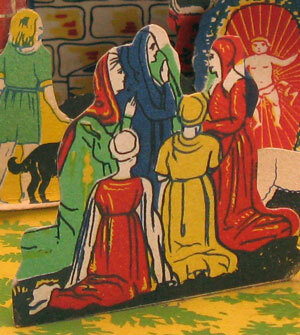 With the roof detached, the nativity folds-up into a small package of 11 x 8,5cm; setup it measures 27,5cm wide x 15cm deep. There are no markings. F.U. 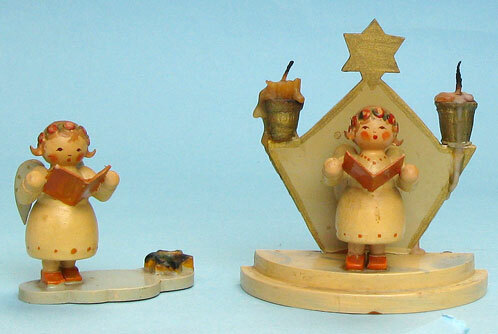 Wooden candle holders with angels, marked "F.U." and "F.U. ??? 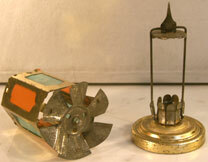 ", ca 6cm high and 9cm high; in my opinion they are old, even maybe pre-WW2. 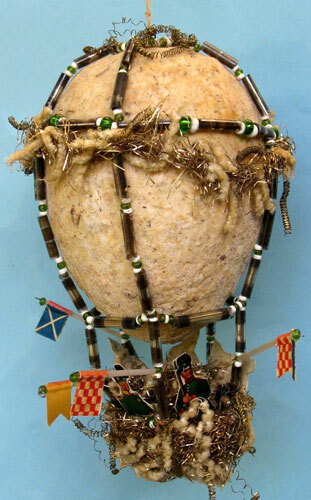 Because of the flower crown they remind of the Wend & Kühn so called "Margeritenengel"
Now this air balloon is classified as cotton, but after looking at it in more detail I am not sure. 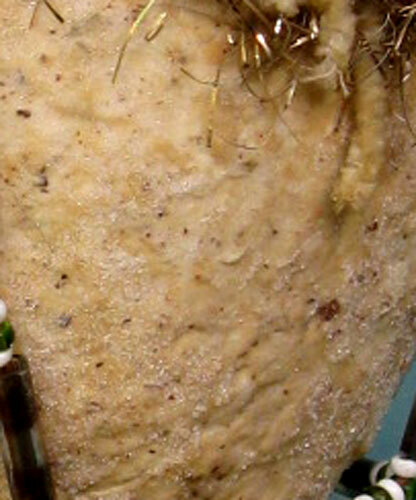 Furthermore when I tried to stick a thin needly in it, I could not. The balloon is covered with a hard material that glissens here and there. It reminds me of tragant, but the ball is very lightweight, so the "dought" should be covering for instance a glass ball. When tapped, it gives a sound that it could break. 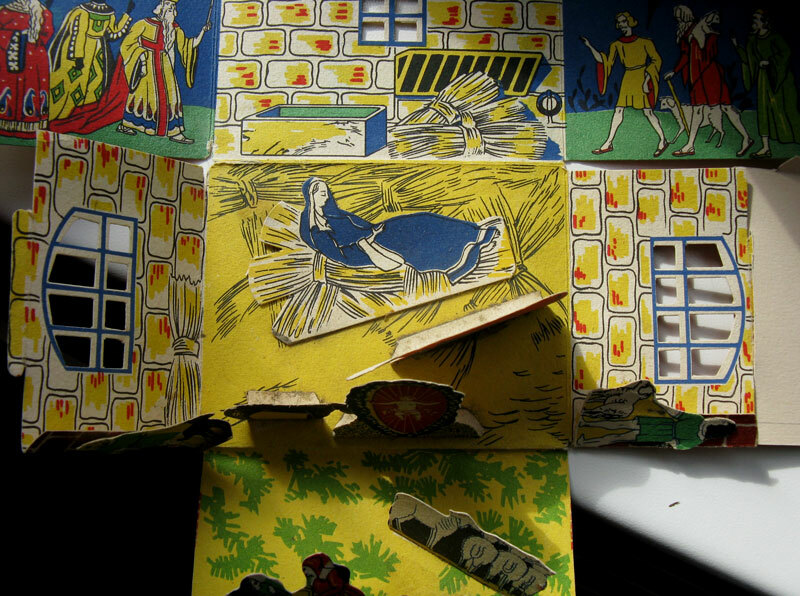 The four soldiers have been cut-out from rather thick white cardboard and together with the signal flags they are WW1. I would like to know what the material is that covers the balloon and if something similar is around. 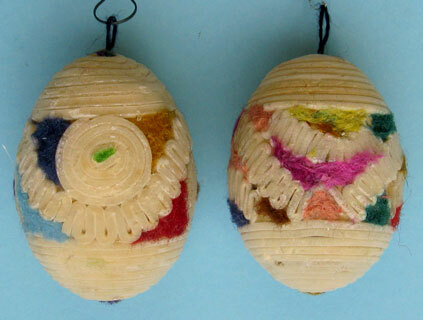 Two ovals, base is a real egg, covered with colored wool. At first I thought the cream colored bands were tragant or macaroni, but they are soft to the touch and a close-up reveals nothing. Could they also be wool? The hook should be straight, as shown in the next picture. 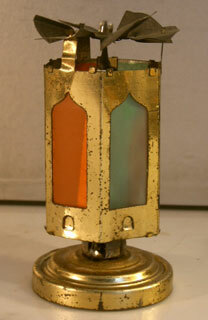 On it should be positioned a shade, which then rotates when the candle is lit; this shade does not fit - just an example – it is of another system. 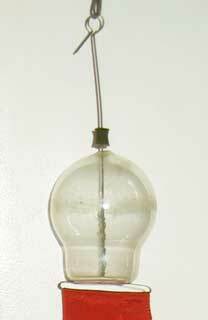 An example of a complete system, but possible younger. The only information on the internet is about the production of scraps (or die cuts), but apparently also other items were produced. So more information is welcome. Signature is unknown to me and I cannot decipher it. Would certainly appreciate any information on this. I have only the above pages of this book and I would like to know the title and the correct sequence of the pages. 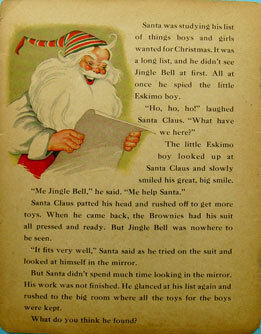 The pages are unnumbered and Santa's red suit is covered in some sort of red imitation material feeling somewhat rough to the touch. 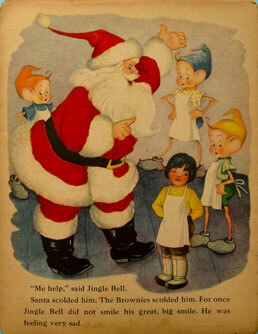 The story is about Santa getting everything ready with the help of the Brownies and a little Eskimo boy, Jingle Bell. 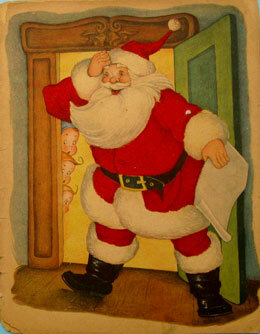 "Santa Claus A Fuzzy Wuzzy Picture Story Book"
The illustrator was Eileen Fox Vaughan. 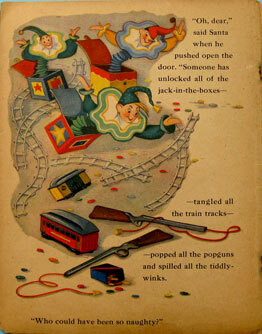 It was published by Whitman Publishing Co. in 1947. 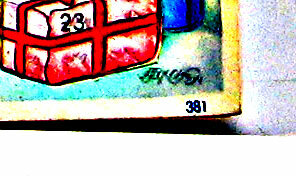 The numbers "2065-25" are on the back cover. Every page is colored. There are 18 pages. 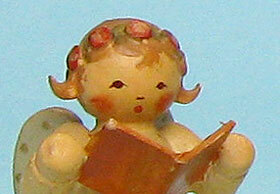 The book measures 12" tall x 9-1/2" wide. 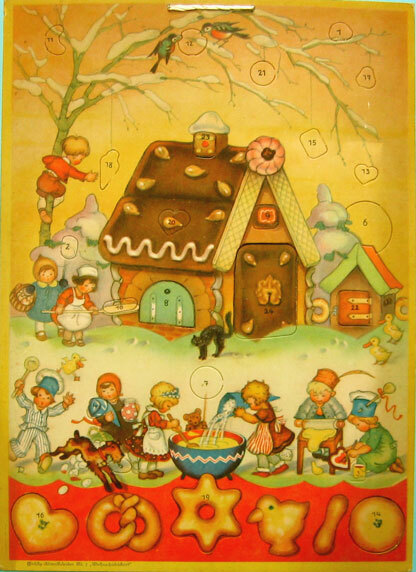 The letters "AFKH" is often found on advent calendars and also on die-cuts (chromos or scraps). On the internet I have found it related to "Krüger". Does anyone know what these letters stand for? SOLVED thanks to Eeva: " Arthur F Krüger Hamburg"
Text in Latin - need help in translation. SOLVED : translation supplied by Frank Paul; Thank you. 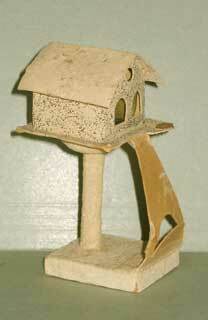 Cardboard birdhouse on stand: does anyone know the purpose of the piece of cardboard in the fron. 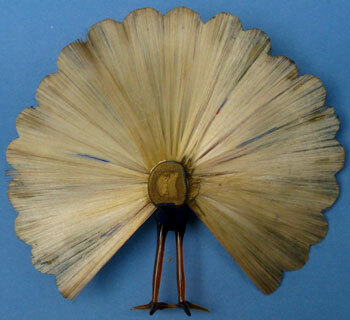 Solved: it is a card holder ! Thanks Daniela! Made of papier-maché, they all have a hole in the base; I have no idea what they were intended for. Maybe a candy containers with the box missing ? Could be to place over a light, but they are too heavy for the tree and I think it would not shine through. 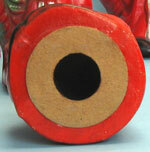 They are shown under the headings "Papier maché and Plaster - all others" and "Candy containers". Solved: According to Daniela they are indeed candy containers, missing their insert . 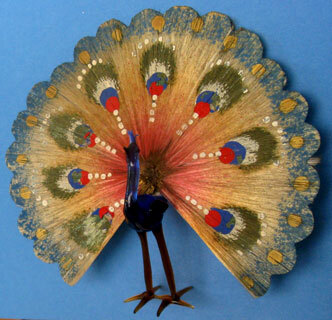 The signature on the back of the peacock reads something like "For?g? ", could be "Foreign" ? ; hope someone can complete or give me the exact name. 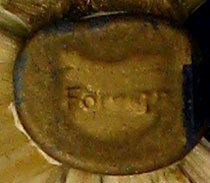 Solved: Ref Daniela: Yes, it is foreign. 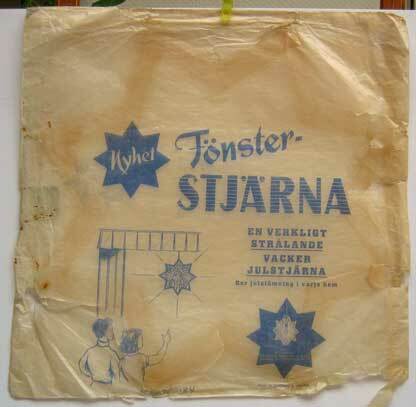 "It was produced in Lauscha/ Germany and "foreign" was used for the export items." The signature on the postcard is "Willy Schermelé" (Willy (Wilhelmina) Schermelé (Amsterdam, April 8, 1904 - March 29, 1995). 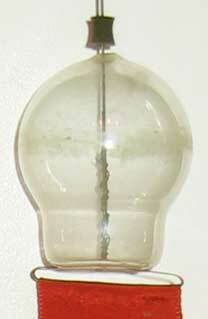 Solved thanks to M. Schroeter. SOLVED! Thanks to Bea Klopstra, it is the monogram of Lilly Scherbauer, illustrator of children books and postcards. Many examples on Pinterest.